The Box Canyon Falls feature a spectacular 285-foot waterfall tucked into a narrow quartzite canyon whose walls rise nearly 100 feet above the falls. The waterfall is driven by Canyon Creek, which rises out of the San Juan Mountains west of town and created the narrow canyon through centuries of erosion in fault-weakened limestone. The creek spills thousands of gallons of water over the falls every minute on its way to meeting up with the Uncompahgre River in Ouray. The city-owned park has three interpretive trails that range from easy to moderately difficult, plus a visitor center and a picnicking area. It’s off U.S. 550 just south of Ouray. The lower trail is an easy, 500-foot hike down a walkway and over a suspension bridge right into the heart of the falls. It’s like entering a dark cave and finding a massive waterfall raging in front of you, spreading cool mist and producing a deafening roar. At the end of the walkway is an optional staircase leading to the base of the falls. The upper trail, High Bridge Trail, takes hikers up 200 feet, half of it on a staircase, to a metal walkway 300 feet above the falls. 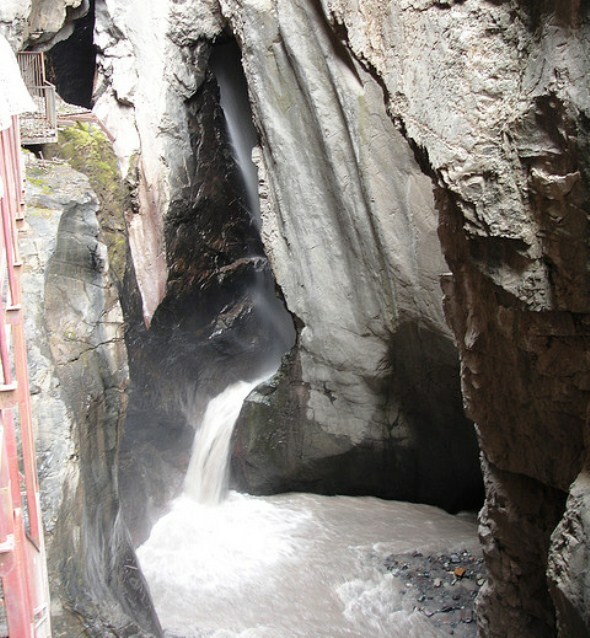 A 100-foot tunnel at the end of the walkway was once used for a water pipeline but now leads to the 4.5-mile Ouray Perimeter Trail. The third trail is the Native Plant Loop, a short, easy interpretive trail. The Box Canyon is a birding hotspot, with a large colony of black swifts. No dogs are allowed in the park. There is a fee for using the trails.